Or as Leone said as the rain appeared through the sunshine "It's a monkey's wedding", a much more charming expression than "sun shower". We got wet but it was quite pleasant and very cooling. This was on another excursion to the city to visit the Art Gallery of Queensland and the State Library. All the galleries, the Museum of Qld and the State Library, are grouped together pretty much on the riverbank, which meant some serious damage was sustained during the Brisbane floods a year ago. However it makes a great cultural precinct and is easily accessible by public transport. Leone and I wandered around the Australian paintings, many familiar to me and some new. My parents were very enthusiastic about the arts and I was fortunate to be taken to galleries and theatre from earliest childhood. I feel very much at home in art galleries and have enjoyed the variety offered in Brisbane with GOMA and AGQ within a few days. Cameras are allowed in the galleries, though not in the paying exhibitions, which is fair enough. I did take a photo of a Margaret Olley painting and I hope it's okay to show it here. 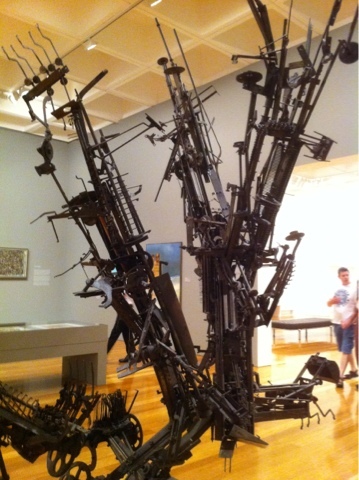 I loved a metal found object sculpture, took some photos, but couldn't find a name for the artist. Nor could I find it online but no doubt someone will tell me. I hope. 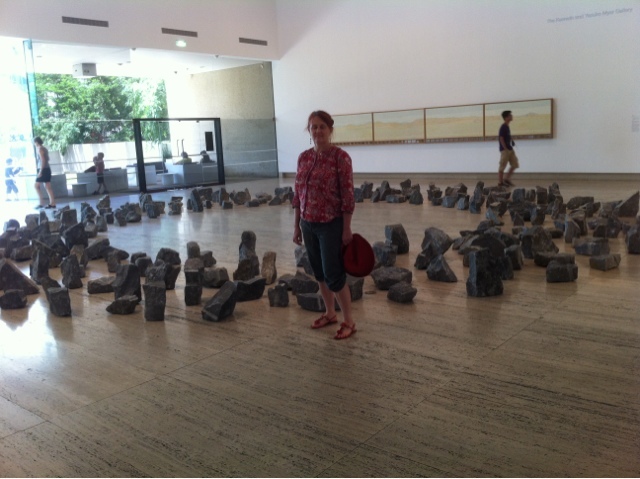 I also took a photo of Leone at the great circle of stones in the foyer of the Art Gallery. Moving on to the State Library, we went to a delightful travelling exhibition called "Look! The art of Australian picture books today". From Victoria, Look! features original artworks by more than 40 of Australia's most talented illustrators. Once again I was left wishing I could draw. Out then and onto the street to get to the movies at The Palace Theatre. This is when it rained -very tropical. We saw The Descendants with George Clooney. For some reason we were expecting this to be a comedy so I was surprised to find myself crying a couple of times. NOT a comedy. We enjoyed it and who knew the Hawaii could be so beautiful away from the traffic. My long awaited workshops have been cancelled for lack of support. After my initial reaction of Nooooooo! 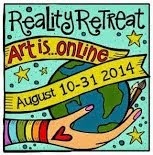 I snapped out of it and started booking myself into similar workshops. So, no Art is you..... for me in March. Hopefully I'll make it into some substitutes. I love the expression "Monkey's Wedding"! I hope I will remember it next summer when I may experience sun showers here. You and Leone are certainly having a grand time seeing Brisbane together, aren't you? And thanks for sharing it all here! Sorry the workshop classes you had enrolled in were cancelled. That is so sad! But you are wise to snap out of it and get on with life, looking for other classes. I was not brought up in a household that appreciated art, but fortunately I married a man who does! We spend a lot of time attending art happenings together and we have always shared the arts with our daughter. She really appreciates it, and is now gifting us with memberships in art museums and botanical gardens...her wonderful way of giving back to us. I will begin exposing Charlie to art via a toddlers class at the High Museum in May. We can attend every Thursday for several hours. I can't wait, and I think he will enjoy it too! Barry, great to see you here. Especially as you are one of my sources of inspiration. Judy, I think "Monkey's Wedding" may be a South African expression, as that is where Leone hails from. You will have such a wonderful time taking Charlie to the toddler's art class. I have a book about art for children, I'll dig it out and tell you the name. I also hadn't come across the 'Monkeys Wedding' expression. Love it. Incontinent little beasts that they are. 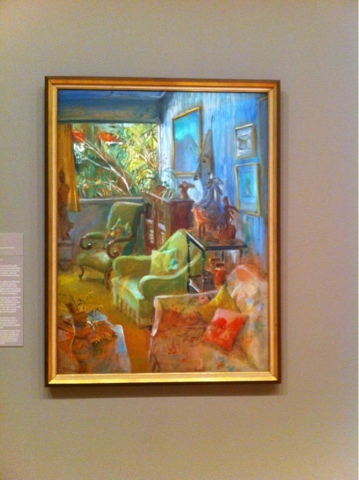 Margaret Olley is always a joy. I hope you find other workshops to play in.